Currently, I am reading a book "Freedom as Development" by Amartya Sen, Nobel Laureate in Economics. Prof. Sen used to be a professor in Delhi University, where started his intellectual adventurism to understand the social justice and all those values that dictates or let us say paint our social foundation, where we connect, live and identify ourselves from the period of birth to death generation to generation. I think Dr. Sen started his intellectual journey in early mid twenties with a deep desire to understand the social and economic inequality that were overtly visible in his surroundings in his youth. Also, I understood that he was trying to understand the dynamic of famines in relation to governance since there was a premise of understanding that famine can only occur where there is no democracy and civil right in the state. One key message that Dr. Sen is trying to inject in reader's mind is plain fact where we are better off in social and economic ladder only when our society (in more responsible term through state mechanism) invest in family through mother's education and their active participation in economic activities. To supplement his argument, he shares examples of another Bengali Nobel Laureate Professor Muhammad Yunus, who aligned the very structure of traditional banking system into micro financing whereby micro lending done to groups of women in the rural communities. This simple but groundbreaking financing of local community with full trust in their capability has changed the landscape of rural economy in Bangladesh, whereby this has brought immense social changes in terms of income generation and rise above the perennial misfortune of income & capability "poverty". The reason that we all agree as always in family values where mothers and sisters play vital role in the wellbeing of all the members. 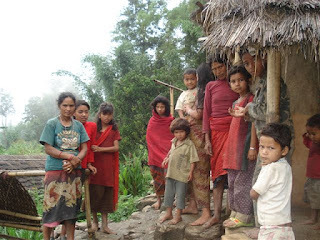 Scenario 1: The mothers will walk for hours to get her children vaccinated and such was our conclusion when I met a family in Mugu in the midst of a jungle trail. Scenario 3: Another challenge that is bottleneck for any nation's vaccination program is when there are pockets of children who are "zero" dose and we like it or not, there are children who miss whole vaccination due to various obstacles that may originate anywhere in the path from provider (governmental health system) to family (lack of awareness/remoteness/lack of trust). Scenario 4: This is a common encounter we come across in the community when we try to understand on closer conversation related to incomplete vaccination, when the family do want to vaccinate but there priority lies on daily food earning for the family, when immunization remains secondary priority. The above scenarios are now, I realize, compelling piece of academic exercise to understand what goes in "real" public health sphere through the lens of biosocial approach, whereby we tend to dissect the very nature of interplay between various contributing or enabling factors such as the socioeconomic milieu, political leadership at all levels, literary situation, "existing" health delivery system from central level to family unit. Now, I again re iterate here that it is incomplete and myopic to analyze the above scenarios from the lens of vaccine science, where we limits ourselves into epidemiological tools or we give so much preferences to only "vaccine", while forgetting or little importance to the very idea of "vaccination". Before moving further, it is also good idea to provide the distinction between these two words, which are inter - related but have some practical differences in terms of its nature of engagement with humanity. Here, I will try to distinct this two words using the vaccine development continuum, where first the candidate vaccine is discovered in laboratory and once the candidate vaccine pass the preclinical studies, then the vaccine goes into clinical trial phases until it gets licensed to be used for human use only when it is acceptable in terms of safety, efficacy and effectiveness in real field scenario. In this spectrum, the vaccine is common everywhere but the fact lies that all these vaccines are meaningless until and unless does not reach the community in acceptable and affordable way. It is only in the community when the importance of vaccine gets realized when it shows real public health impact in preventing unnecessary morbidity and mortality thereby saving lives in the community. It is in this sense linked to the use of vaccine in real community (in need) that the vaccination, which is the act of delivering the much needed vaccine, creates "value for its dollar spent" with immense impact in the community. While trying to understand the real challenges that bring about the above scenarios whereby thousands of children are still either incompletely immunized or zero dose - we need to understand the factors that are in interplay from the "fractured" health delivery system, which is a bit explained in my previous blog post on "Glimpse of Vaccine Delivery in Remote High Altitude Areas of Nepal". Though the blog post provides a glimpse on how difficult and challenging it is for health professionals in those remote areas to provide the routine immunization - it does not provide the full explanation of other equally influential factors which are rooted in the socioeconomic landscape of the community. Before trying to explore the socio economic milieu - we have to agree to the basic premise that the "gap in immunization" portrayed above is not only health issue but also the issue of social justice, equality and liberty. In next post - I will write more in details to socio political roots that play roles in above scenarios. Also, I suggest you to go though this slideshare link to understand better of vaccine delivery challenges in remote areas of Nepal.